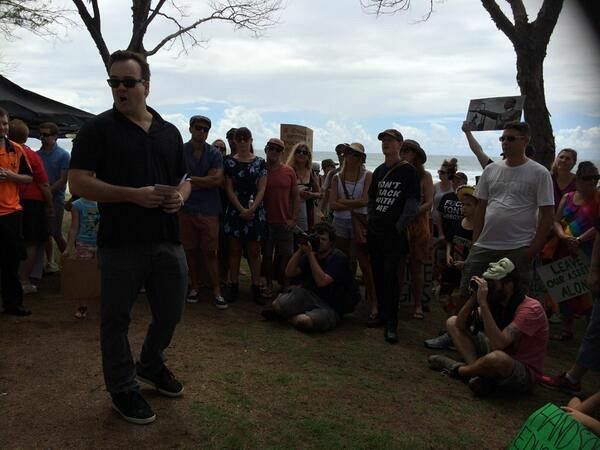 In a speech to the Gold Coast March in March today, managing editor David Donovan minces no words in explaining why it is important Australians reject Abbott and his "corporatist" neoliberal agenda. "When you change the Government, you change the country." During John Howard's seemingly endless rule, the country changed profoundly. John Howard coveted the popularity of Pauline Hanson and so, after he had put her in gaol and stolen all of her supporters, he adopted her ugly, divisive, racist, small-minded policies as his own. It worked well for him. The country was changed forever. Indigenous Australians, asylum seekers, multiculturalism, scientists, academics, artists — anyone opposing Howard and his big financial supporters were in his sights. And who were his big financial supporters? The graspers, the grifters, the plutocrats, the big corporations — all the people who fund the Liberal Party for millions every year. Let’s call them ‘the corporatists’. Howard said he wanted to make Australians "relaxed and comfortable", and so to do that he spent the profits of the mining boom buying the votes of upper-middle bogans and cutting the taxes of his financial supporters. Building Australia didn't get a look in. He may have put up a few flagpoles — but not much else. By 2005, the people who were paying the Liberal Party's bills wanted more. It was time for Howard to pay back more of his debt to them. And how did they want it repaid? They wanted to pay their workers less, of course. And so Howard brought in WorkChoices. WorkChoices, let’s be very clear, was about nothing else other than paying working men and women less and taking away their entitlements and conditions. This was something the corporatists had always wanted — both ideologically and financially. Howard tried to give it to them. But he failed. Howard tried to give the corporatists cheap people. But, thankfully, he couldn't manage it. After a brilliant campaign by the trade unions of Australia, the Australian people voted Howard out. And the country did change with Rudd — for a while. Before six months had elapsed in his prime ministership, Rudd had said sorry to the Stolen Generations. He had abolished the Pacific Solution. He had ratified the Kyoto Protocol. He had, most importantly, started spending money on home insulation and vital school infrastructure, which also managed to save Australia from the Global Financial Crisis. We were getting our country back. We were regaining the respect of the world. We were working to solve the problems besetting humanity. We were building assets for our families and communities, which we could all use and about which we could be proud. The corporatists gritted their teeth. Then Rudd went further — too far for them. He wrote an essay in The Monthly decrying neo-liberalism. Warning bells rang for the corporatists. The alarms moved up an octave when Rudd tried to bring in an ETS. The Liberal Party leader of the day, Malcolm Turnbull, also supported action on climate change, but the corporatists pulled one of their dirty tricks with Godwin Grech and got rid of him with ease, bringing in a thick-headed compliant stooge in the shape of Tony Abbott. Then Rudd tried to bring in a mining tax, so we could all get a fair share of Australia's mineral wealth. The alarms moved to DEFCON 4. The extremists, the plutocrats, the corporatists who really run Australia ‒ the miners, the bankers, the foreign media moguls ‒ they all got together and hounded Rudd out of office. In came Julia Gillard — so they used the obvious dissension in the Labor Party to undermine her as well. She wasn't meant to win in 2010, but she did — just. And she and the Independents did a good job in shepherding Australia through the last three years. But you wouldn't have heard that from the biased, yellow, Tory press. A U.S. national, with far too much interest in Australian domestic affairs, set to work vilifying and destroying Australia's first female Prime Minister. And the level of misogyny, bigotry and hatred stunned everyone with a shred of decency in their soul. It may not be a popular thing to say, but Australia was well-run by Julia Gillard. Can we say the same today? With Murdoch running the PR for the Liberals and the Abbott camp, there was never any doubt he would become PM. The vitriol and bias from the owner of 70% of Australia's press was beyond anything we have ever seen — anywhere in the world. The front page that sticks in my mind is the one saying: 'Kick this mob out'. Media bias doesn't get much cruder than that. And so Abbott was installed above us as Australian Prime Minister. In short, he is too much of a dickhead to be Australian prime minister for long. So the people who really run this nation need to get their neoliberal agenda through as quickly as possible. And we have seen that in the first six months of Abbott's Government. Keating and Howard said, when you change the Government you change the country — well, everything is changing very quickly under Abbott. The auto industry has gone, penalty rates are going, the Barrier Reef is about to wear a layer of sludge, and Gina Rinehart looks like she will get her wish and soon be able to pay no tax at all. Oh, and Rupert Murdoch will soon be able to own every newspaper, television station and radio station in Australia. The corporations ‒ the ones who really run things ‒ have got their dream by having Tony Abbott in power. They think they have won. We must make them think again. It is us ‒ the people who have marched in March all over Australia, 100,000 of us and more ‒ who will stop their evil plans for Australia. They think they've got us on the run. But who do they think they're kidding? Their time is coming swiftly to an end. It is time for us to say: Down with the oligarchs. Down with the plutocrats. Down with the people who will make your children work for $2 a day. 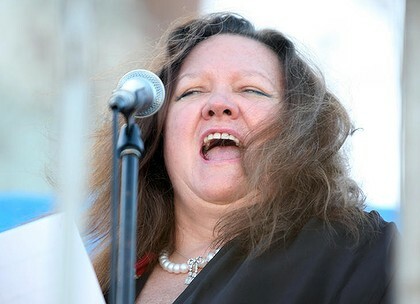 Down with Gina Rinehart. Down with the IPA. Down with the mindless media that will fill your head with propaganda and rubbish. Down with Murdoch. Down with Abbott and his neoliberal henchmen.